The other day a pretty impressive brand name showed up in the "These Come From Trees" paypal email bin: SanDisk. For those of you who need refreshing, SanDisk makes the memory cards that make your and my cell phones run. I have an 8GB SanDisk chip in my mini HD video camera I got recently, and I love it! One of SanDisk's facilities staff picked up 200 These Come From Trees stickers, and when emailed asking what they're planning on doing with them, he mentioned that they are going to deploy them across the campus as part of a larger greening intitiative they're working on. 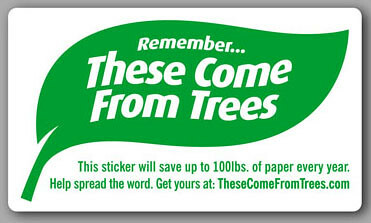 You can see more examples of organizations using These Come From Trees stickers to conserve paper at their offices here.